by Michael Selinfreund, Esq., President/General Counsel of Cherry Creek Title Services, Inc.
All mechanics liens relate back to the time of the commencement of work under the contract between the owner and the first contractor, or, if said contract is not in writing, then such liens shall relate back to and take effect as of the time of the commencement of the work upon the structure or improvement, and shall have priority over any lien or encumbrance subsequently intervening, or which may have been created prior thereto but which was not then recorded and of which the lienor did not have actual notice. Often the first work is commenced by the very first party with lien rights, typically the engineers and/or surveyors, and then all other claimants get the benefit of that date. C.R.S. § 38-22-108 specifies liens will be satisfied in the following order: first to the liens of all those who were laborers or mechanics working by the day or piece, but without furnishing material therefor, either as principal or subcontractors; second to all other subcontractors and of all materialmen whose claims are either entirely or principally for laborers, materials, machinery, or other fixtures, furnished either as principal contractors or subcontractors; and last to all other principal contractors. Let’s turn now to the perspective of the property owner burdened or potentially burdened by a mechanic’s lien. It pays to be vigilant and know which subcontractors are being engaged by the contractor and where the materials are being obtained. This way, the property owner can require and obtain lien waivers from all such sub-contractors and materialmen at the time of making any payments. C.R.S. 38-22-119 limits the effect of any such lien waiver as being solely between the parties to the contract. So, if there is still an unpaid subcontractor or materialman who worked under the contractor being paid, they would still be able to file a lien in the event the contractor fails to pay them. C.R.S. 38-22-119 (2) provides that an agreement to waive lien rights shall contain a statement, by the person waiving lien rights, providing in substance that all debts owed to any third party by the person waiving the lien rights and relating to the goods or services covered by the waiver of lien rights have been paid or will be timely paid. However, many such waivers have been fraudulently executed with unpaid subcontractors and materialmen lurking behind the scenes. When faced with a filed mechanics lien, the first thing to do is verify the claimant complied properly with the ten-day intent provision (discussed in Part 1 of this article); is claiming the proper amount owed (see C.R.S. 38-22-128); and filed timely per C.R.S. 38-22-109. A large percentage of such liens are filled-out and filed by the unpaid contractors, and many have fatal errors. The next thing to consider is whether the lien has expired. C.R.S. 38-22-109(8) states that such liens do not remain effective longer than one year from the filing of the lien unless within 30 days after each annual anniversary of the filing of the lien statement, an affidavit is filed stating the property improvements have not been completed. That’s why many title companies require 13 months to have passed before insuring over a recorded Mechanic’s Lien in Colorado. C.R.S. 38-22-110 provides that no lien shall hold the property longer than six months after the last work or labor is performed, or laborers or materials are furnished, or after the completion of the building, structure, or other improvement, or the completion of the alteration, addition to, or repair thereof, unless an action has been commenced within that time to enforce the same, and unless also a notice (typically a Lis Pendens) stating that such action has been commenced is filed for record within that time in the office of the county clerk and recorder of the county where the property is located. Where there is no notice of commencement of the action filed, there can be no cloud upon the plaintiffs’ title. See Schlosky v. Mobile Premix Concrete, Inc., 656 P.2d 1321 (Colo. App. 1982). So, the lien claimant is often time barred from filing suit as most do not have the money to pursue lien foreclosure actions in District Court and six months goes by quickly. 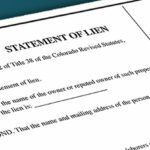 The majority of liens filed are not foreclosed, rather, the lien claimant is hopeful that their lien stands in the way of a sale or refinance transaction thereby forcing the property owner to pay them. However, even in those circumstances, the property owner can bond around such liens pursuant to C.R.S. § 38-22-131. One statute that is often helpful for the burdened property owner is C.R.S. § 38-22-125; the Bona fide purchaser statute. It provides that no lien, excepting those claimed by laborers or mechanics as defined in section 38-22-108(1) (a), filed for record more than two months after completion of the building, improvement, or structure shall encumber the interest of any bona fide purchaser for value of real property, the principal improvement upon which is a single- or double-family dwelling, unless said purchaser at the time of conveyance has actual knowledge that the amounts due and secured by such lien have not been paid, or unless such lien statement has been recorded prior to conveyance, or unless a notice as provided in section 38-22-109(10) has been filed within one month subsequent to completion or prior to conveyance, whichever is later. When applicable, C.R.S. 38-22-113 is extremely beneficial to the property owner. It provides that it shall be an affirmative defense in any action to foreclose a mechanics lien that the owner or some person acting on the owner’s behalf has paid an amount sufficient to satisfy the contractual and legal obligations of the owner, including the initial purchase price or contract amount plus any additions or change orders, to the principal contractor or any subcontractor for the purpose of payment to the subcontractors or suppliers of laborers or materials or services to the job, when the property is an existing single-family dwelling unit; the property is a residence constructed by the owner or under a contract entered into by the owner prior to its occupancy as his primary residence; or the property is a single-family, owner-occupied dwelling unit, including a residence constructed and sold for occupancy as a primary residence. One final important statute to be aware of is the Contractor Trust Fund Statute. C.R.S. 38-22-127. In the event the property owner pays the contractor directly or via loan disbursements from the construction lender, and the contractor fails to pay subcontractors and/or materialmen, an express trust relationship is created for all such payments received, and C.R.S. 38-22-127(5) defines the failure to pay the subcontractors or materialmen as theft under C.R.S. 18-4-401. An individual in complete control of the finances and financial decisions of an entity that violates the statute is personally liable for such violation. See Alexander Co. v. Packard, 754 P.2d 780 (Colo. App. 1988). Further, debts arising from violating the Contractor Trust Fund Statute are not discharged by filing bankruptcy. Finally, Mechanics’ liens may also be defeated by the filing of bankruptcy proceedings by either the property owner or the general contractor. This is a complex subject and beyond the scope of this article.